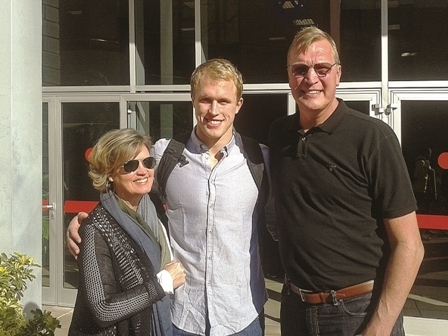 Iberostar Tenerife’s last home game offered nearly as much interest off the court as on in the shape of NBA legend Jack Sikma, who flew in to Tenerife to see his 25-year-old son Luke in action for the first time in the jersey of the La Laguna club. 31.12.2014 - The seven times NBA All-Star, who played for Seattle and Milwaukee, crossed the Atlantic with his wife Shawn for a visit to the Canaries that enabled them to witness Iberostar overturn a seven-point deficit in the closing minutes to secure a 66-62 win over Manresa on December 7. The couple also took in the big Canarian derby against Gran Canaria in Las Palmas last week-end. Sikma Sr, who has had stints as assistant coach at three NBA clubs over the past decade, also accepted an invitation to host a talk about his career for local basketball coaches in the Hotel Mencey. Island Connections caught up with the ex-player, who is widely considered one of the NBA greats due to a glittering 14-year career (1977-1991), and asked him how it felt to be in Tenerife watching the second Sikma generation in action professionally. It was a déjà vu experience in more ways than one given that Luke wears the No. 43 worn so magnificently by his Dad at Seattle for so many years. “The game was very physical and I think Luke played well overall despite being up against Manresa’s top player, Croatia’s Zelko Sakic. He was clearly angry and frustrated when he was blown up for a fourth foul but he recovered with some big scores late in the game,” explained Jack, who had to contend with an avalanche of requests from fans for a souvenir photo both during and after the game. The Sikmas decided to fly over to Tenerife from the north-eastern tip of the United States when it became clear that Luke would not get home to Seattle for Christmas due to his team’s four fixtures in less than a fortnight over the holiday period. “We are here for a couple of weeks, taking in two games and staying with Luke at his place. We have another basketball-playing boy back home in Luke’s younger brother, Nate, who plays at the University of Hartford in Connecticut,” said Shawn. The couple may well have to pencil in more trips in the coming years as Luke is, in their own words, “Very comfortable” living over here in the Canaries. “I don’t know where his career will take him. He wants to make the most of every day and he is certainly drawing lots of positives from playing in Tenerife. It is a scenario he really enjoys and he is very happy with his team mates and the coaching staff. Thanks to the wonders of Internet, I can follow his games on computer from home,” said Jack, just minutes after seeing his son help lead the miraculous recovery against Manresa. Not even the most optimistic parent could have foreseen that the young Luke, fresh out of PortlandUniversity, would, ‘cross the pond’ and make such a name for himself in the Spanish game, firstly in the second division with La Palma and Burgos and now in the ACB Premiership. Currently in his second season in La Laguna, where he must surely rate as one of the club’s shrewdest signings, he has continued where he left off last year and has spent the first three months at the top of the individual rankings in the world’s second toughest league. Island Connections can reveal that total immersion in local culture does not mean Luke does not hanker for certain things from back home. Our spies at Tenerife airport noticed three bottles of a certain brand of chicken wing sauce (!) in the luggage of Shawn Sikma on her arrival on the island. Luke can count himself lucky that he ordered his favourite sauce from his mother, given that his Dad’s suitcase went AWOL during the long trip from the States and he had to be very creative to come up with clothing solutions for his giant frame, including some hand me downs from his son.